Working and living in the Czech Republic require to fill documents and obtain certificates, all in order to do everything under the law. Here you can find some basic knowledge regarding trade licence and how to get one! Getting the trade licence involves a certain amount of bureaucracy (yep, a true bummer!) and it’s surely a bit complicated, but remember that you can always count on Foreigners for help! 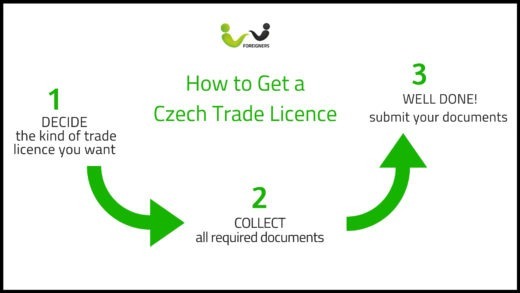 One of the common routes to do business in the Czech Republic is through the sole proprietorship, often called a trade licence. A sole proprietor (osoba samostatně výdělečně činná, or OSVČ) is a physical person who has income from carrying out a business and/or self-employment (a freelancer or entrepreneur). A sole proprietor may be registered with the Commercial Court (Obchodní soud), or the trade licence regulator (živnostenský úřad). The sole proprietor is liable without limitation and can trade on his/her full name – to which s/he might attach some customized trade name. · Proof of citizenship or legal residency (a long-stay or permanent residence visa). · A foreign criminal record extract or affidavit confirming to have no criminal record. · The owner permission (souhlas vlastníka) for the place of business. · A properly compiled trade licence selection form. There are 80 unqualified trades that can be included in the trade licence. Trades/job as language teaching, tourist services or photographer, are within the above 80 trades. In addition, 17 craft trades like locksmith, watchmaking or goldsmithing are applicable for a licence. A special guideline must be followed in order to operate a business in the Craft fields. At last 32 professional trades, like optician, medical devices manufacturer or tax accounting are on the list as well. Related education and/or experience in the field must be proven if you want to include them in your trade licence. Keep in mind that craft and professional trades might also be regulated by special laws, made to ensure adequate ethic and product standards e.g: hygienic ones if you work as a farmer. So remember to always take extra-care on this issue. When you apply for a trade licence you’re a freelancer, not an employee. Given that you have to pay for your own taxes, every year in March. The amount of them depends on your annual income. To respect the law you will also have to register for social security insurance and pay for it monthly. If you want to work as a freelancer, you’ll need health insurance and about that your obligations depend on where are you from. If you are a Czech or EU citizen or a person with a permanent resident permit you’ll have to get a public health insurance in order to work. If you come from Countries like U.S.A. or Turkey, even if you have only a visa, you’ll have to apply for the public health insurance. Finally, if you come from a country which is not part of the EU and out of the above-mentioned list, you’ll have to get a private health insurance in order to work in the Czech Republic. Given its mandatory nature and complexity, always take extra care on this particular issues, maybe with the help of an expert. All considered, having the trade licence is one of the best options when it comes to working in the country, if you want to know the benefits, click here! 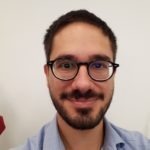 Hello dear readers, I'm Gianandrea, Italian, currently living in Prague and ready to bring to you everything that this beautiful city and our company have to offer!